Assunta Ng, founder and publisher of the Seattle Chinese Post and Northwest Asian Weekly who has devoted her life to promoting and mentoring women and youth, is the 2011 recipient of the University of Washington’s Charles E. Odegaard Award, Vice President for Minority Affairs and Vice Provost for Diversity Sheila Edwards Lange announced Monday. The award will be presented at the 41st annual EOP Celebration, Féte and Honors hosted by UW Office of Minority Affairs and Diversity (OMA&D) and the Friends of the Educational Opportunity Program (EOP) on Thursday, May 5, at the Bell Harbor International Conference Center. The dinner and scholarship fundraiser will be held from 5:30 p.m. to 8:30 p.m. Established in 1973, the Odegaard award honors individuals whose leadership in the community exemplifies the former UW president’s work on behalf of diversity. It is the only University and community-selected award, and is regarded as the highest achievement in diversity at the UW. Ng joins a long list of civic leaders who have received the award including former Seattle mayor Norm Rice and Washington state representative Phyllis Gutiérrez Kenney. 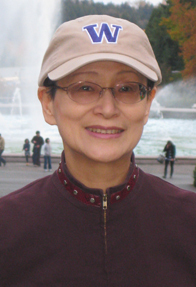 A native of China, Ng came to the United States in 1971 and supported herself through nearly her entire college education. She received a bachelor’s degree in international studies and education from UW in 1974, before earning a teaching certificate in 1976 and a master’s degree in communication in 1979. Ng began her journalism career as an undergraduate writing for the UW Daily. She taught social studies to immigrants at Mercer Junior High School for a few years until becoming increasingly aware of the lack of information available to Seattle’s Chinese community. It was then that she founded the Seattle Chinese Post in 1982, the first Chinese newspaper in the Pacific Northwest for half a century. One year later, she founded the Northwest Asian Weekly, the only English-language Asian weekly in the Northwest. In addition to serving as the publisher for two newspapers, Ng devotes countless hours to volunteer efforts. She has established several community projects and organizations including the Northwest Asian Weekly Foundation, an organization that designs leadership, community-building and diversity training programs for youth and adults. Ng also established the Women of Color Empowered luncheon series to showcase women of all ethnicities. She has helped to raise millions of dollars for many charitable causes including those that benefit foster children and the victims of domestic violence. In addition, Ng has donated funds to OMA&D’s EOP Scholarship program and raised money for scholarship endowments in the UW Evans School of Public Affairs and the UW Foster School of Business. Ng has received countless awards and honors including the 2008 Wells Fargo Trailblazer Award for women in small business, the 2006 Hillary Clinton and Maria Cantwell Women of Valor Award, the 2005 Puget Sound Business Journal’s Women of Influence Award and the 1998 Multicultural Alumni Partnership (MAP) Distinguished Alumnus Award. She was inducted into the UW Department of Communication Alumni Hall of Fame in 2004 and was named a UW Department of Communication Distinguished Alumna in 2005. For more information on Celebration 2011 or the Charles E. Odegaard Award, please visit the Celebration web site.